How could there not be any reviews, as of March 2019, of Night of Desirable Objects on Prog Archives? First, a bit of background (actually, this is almost all of the background I know of). Snakefinger (Philip Lithman) was a British guitarist and singer whom I heard of primarily through his association with the Residents. He guested on a handful of their late-1970s and early-1980s albums, and was signed to their record label. Apparently the Vestal Virgins were a real band, but it also appears as though Snakefinger was the main attraction on the road and the bandleader behind the scenes. 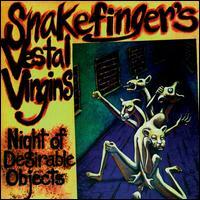 Night of Desirable Objects was released about four months before Snakefinger's death while he was on tour. In terms of its musical atmosphere, Night of Desirable Objects sounds like it was recorded in 1980 or 1981. The sound quality is good, as are the performances, especially Snakefinger's fretwork. Night of Desirable Objects seems to have been most directly influenced by the Talking Heads, although the drum-machine and synthesizer of "The Golden King" would already be a homage to 1980s Nile Rodgers, even without the call-and-response vocals. There's also some reflection of Frank Zappa and Adrian Belew. The songs vary widely- - or maybe wildly - - from European folk to new-wave to guitar-based jazz and rock. About half of the original album is comprised of cover songs. "Sawney Bean" is an old, obscure English folk song about the fabled Scotsman cannibal Alexander Bean, while the traditional "Sophia's Playful Pipes" is identified in discogs.com as a Bulgarian tune. "Jesus Gave Me Water" is an early 20th-century African-American hymn popularized by Sam Cooke. "Move" was written by bebop drummer Denzil Best and made famous by Miles Davis on Birth of the Cool. And "8¼" is based on Rota's score for the Fellini film 8½. The original songs (including the eight bonus tracks on the version I downloaded from emusic.com) are nearly as diverse. As good as "The Golden King" is, the best song here is "There's No Justice in Life." Night of Desirable Objects falls short of masterpiece status in my opinion, mainly due to the compositions, which are good, but not great. Nonetheless, this is an excellent album, with or without the bonus tracks. While Snakefinger is listed here as "avant-prog," Night of Desirable Objects is something closer to eclectic. Even if the Residents are too far out for you - - much of their work is to me also - - I'd give this disk a try.